Hi there! My name is Missy Kacy and I am thrilled to be sharing this journey with so many wonderful families. Today this is more than a passion. It's more than a dream wish for me. Now it is an amazing part of my life. When asked by a dear friend a few years ago, if I would consider "practicing" doula skills with her, it was the best gift I could be given! I decided in that moment that there would be no more wishing, that it was time to make this official, and become a professional birth doula. 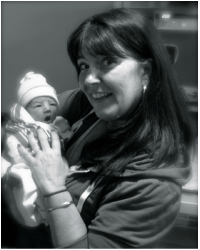 I joined CAPPA which is the world's largest Childbirth and Postpartum Professional Association. Through them, I have had extensive training, and education. This is an ongoing process, and we are expected to stay up to date on current research and important issues, topics, and evidence-based practices. I am also certified in the art of using a rebozo (long piece of woven fabric) to help relax and provide comfort before, during, and after labor, trained in Spinning Babies comfort techniques, and Reiki. Experience, education, and passion. These are some of the qualities that help me be the very best for YOU!